Make a direct impact in the community by donating a Veggie Box. 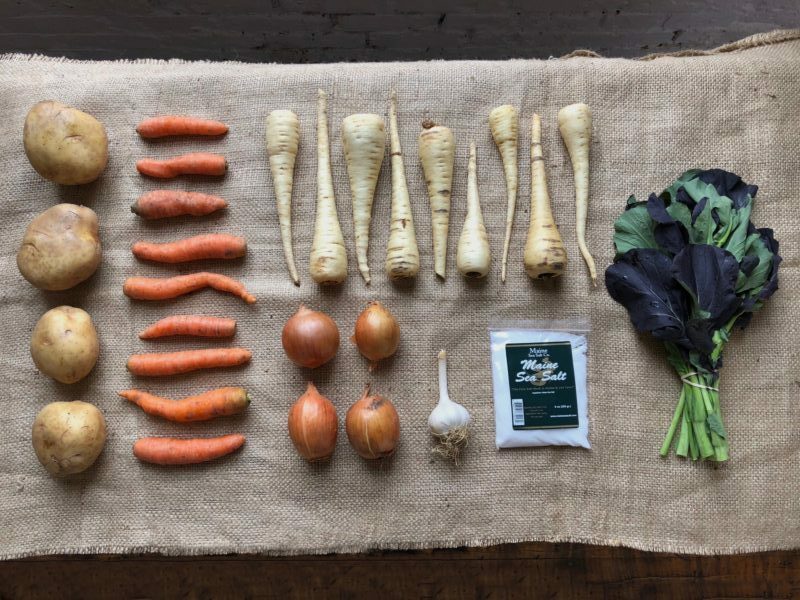 Not only will you be supporting local farms with your purchase, your donation will help ensure that Rhode Islanders in need receive a generous supply of fresh, nutrient-rich food. Veggie Box is now offering a new speciality “add-on” box: Pantry-Ready Snacks! 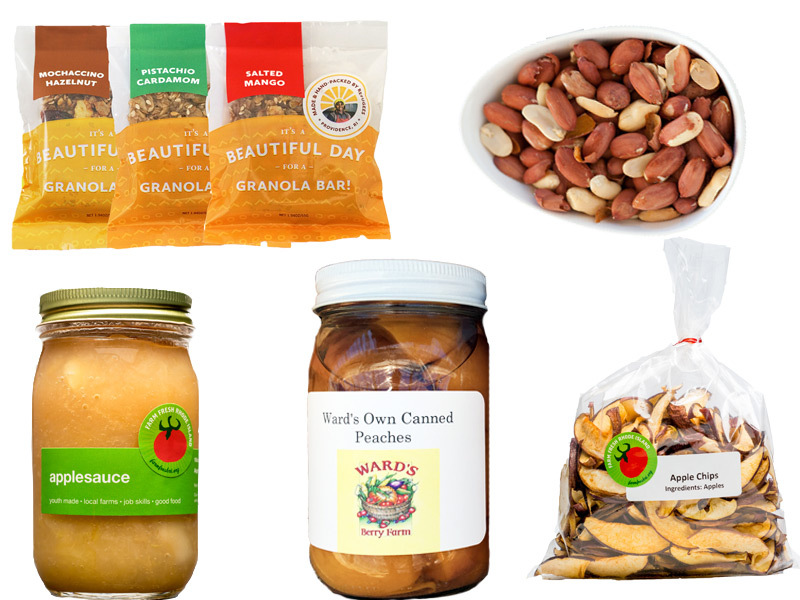 This box features a number of unique products from local producers like Harvest Kitchen apple chips & applesauce, Wards Berry Farm peaches, Virginia & Spanish nut mix, and Beautiful Day granola bars! 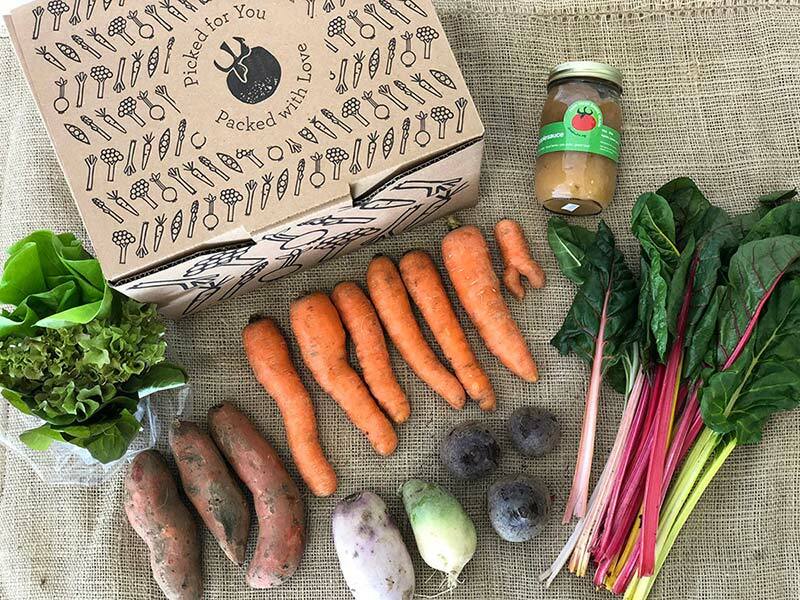 Not a Veggie Box subscriber? No problem! Any of our add-on boxes can be purchased without a subscription. There’s no commitment. 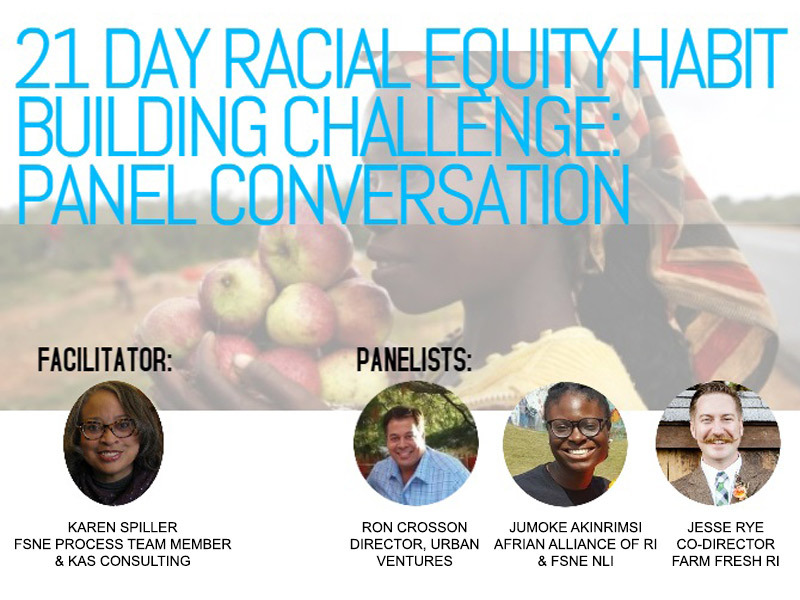 Don’t miss these food system news items from around our region: Join Food Solutions New England, African Alliance of RI, and panelists including our own Jesse Rye for a conversation about the 21-Day Racial Equity Habit Building Challenge April 12! Great news for National Farm to School funding. And it’s almost time for SCLT’s Urban Agriculture Kick-Offs around Providence. The Rhode Island Blood Center will be outside the Pawtucket Wintertime Farmers Market Saturday, April 21, 10am to 1pm collecting donations. 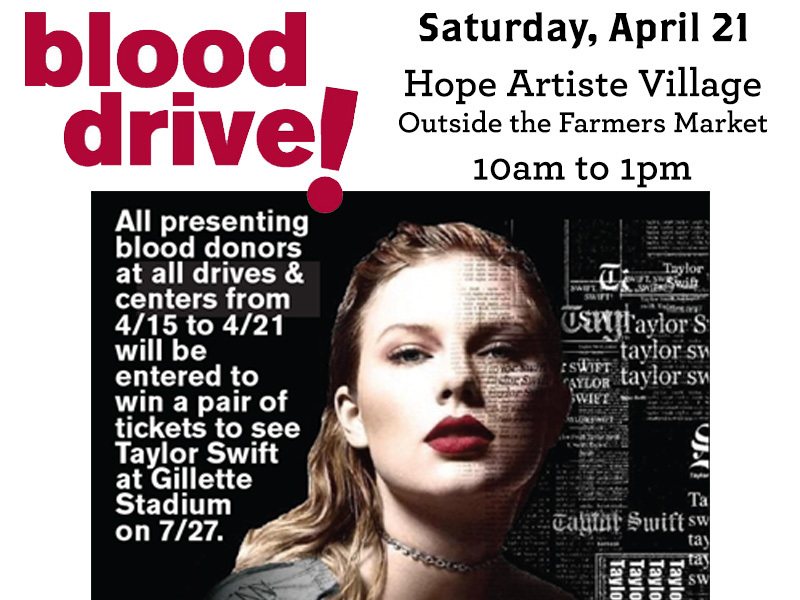 All blood donors will receive a free reusable grocery bag — AND be entered to win a pair of tickets to see Taylor Swift this summer! Have you seen the latest beautiful edition of Edible Rhody magazine yet? 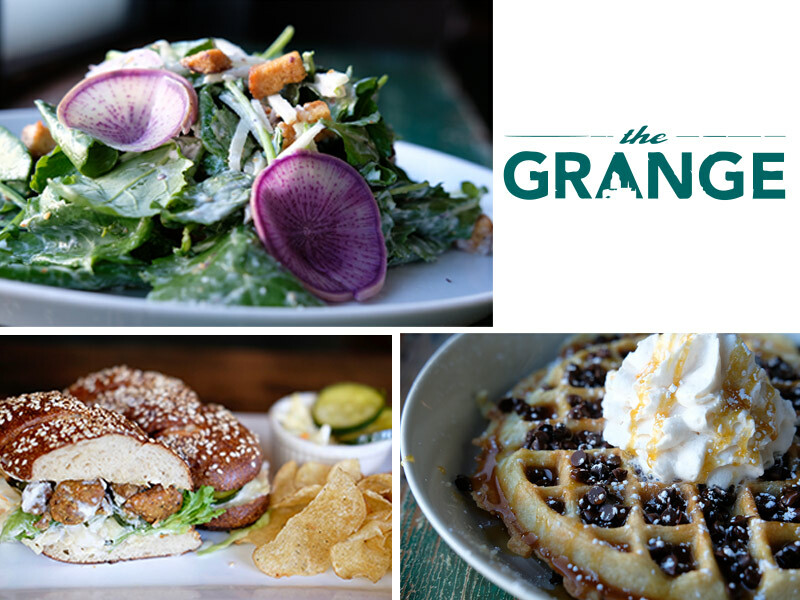 It’s a great read for all things foodie in Rhode Island. 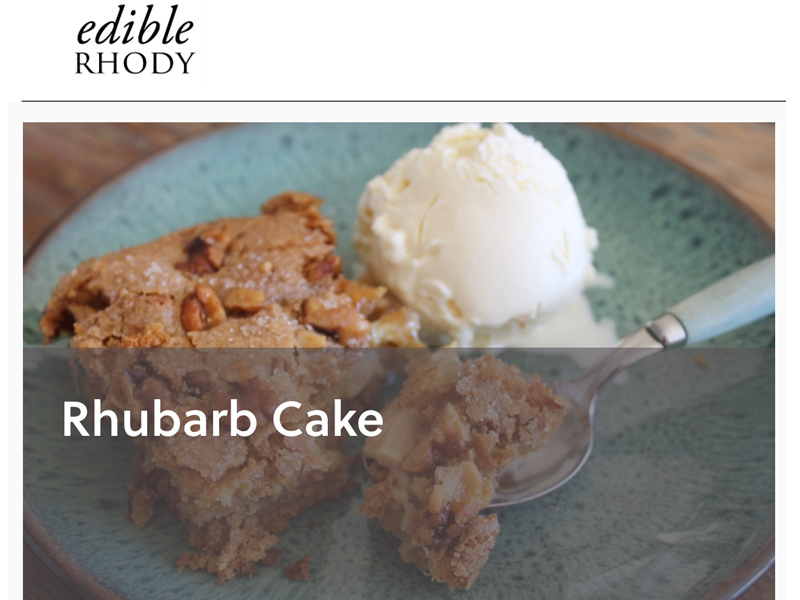 Among other great recipes in this season’s issue, Edible Rhody featured a delicious Rhubarb Cake recipe by our very own Harvest Kitchen Program Director and Executive Chef Jen Stott! There are just four Saturdays left this season at the largest indoor farmers market in New England! Tomorrow enjoy tunes by local musicians David Schneider and Karen Isenberg, and visit with civic groups Children’s Friend, Urban Greens, and Camp Kesem. 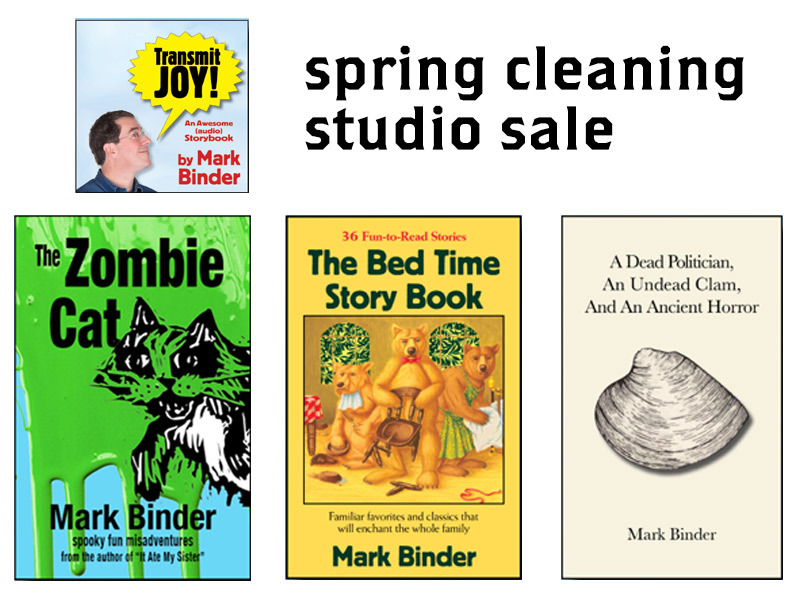 And be sure to check out local author and storyteller Mark Binder’s spring clearing sale upstairs from the market! We are looking for three AmeriCorps VISTA members to join our team this summer! Apply for the “Growing and Garden” and “Food Literacy” positions by April 26. Apply for the “Volunteer Coordinator” position by May 25. 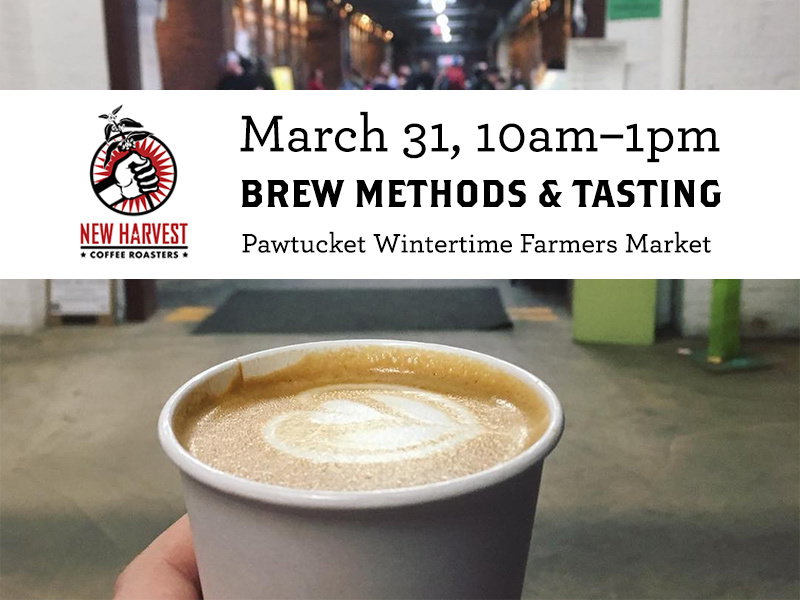 It’s the last March Madness Saturday of 2018 at the Pawtucket Wintertime Farmers Market. Enjoy a FREE coffee brew-methods demo and tasting by New Harvest Coffee Roasters. 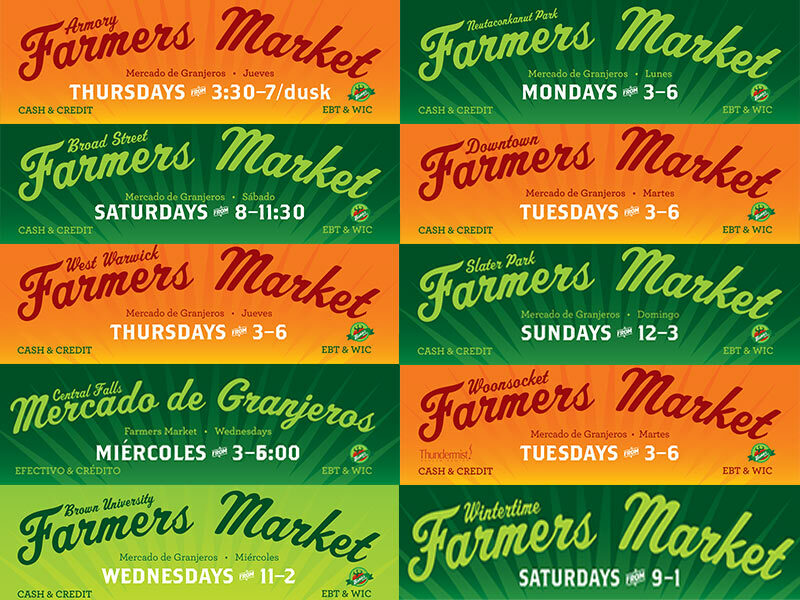 And be sure to turn in your completed farmers market Scavenger Hunt maps by 1pm! 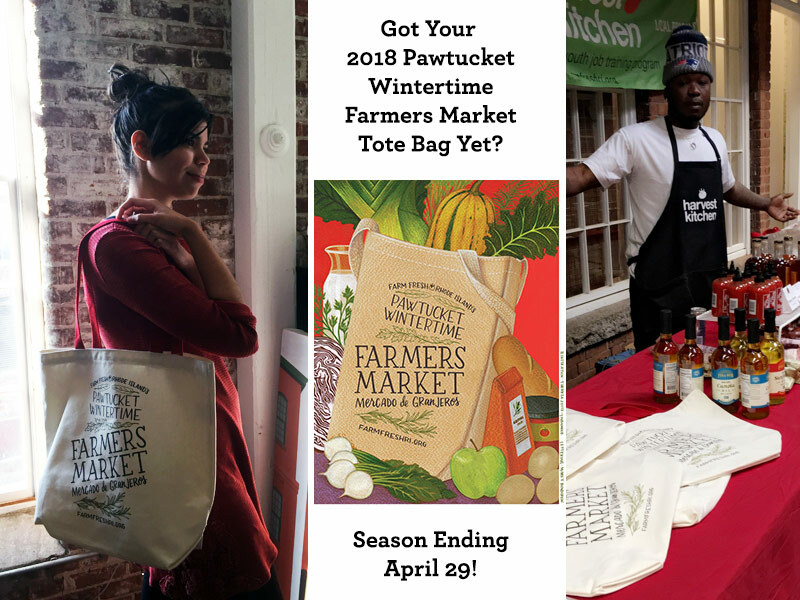 The Pawtucket Wintertime Farmers Market season of 2017-2018 is nearing its end — the last market is Saturday, April 29th. Now’s the time to get your commemorative tote bag of the season, while supplies last! 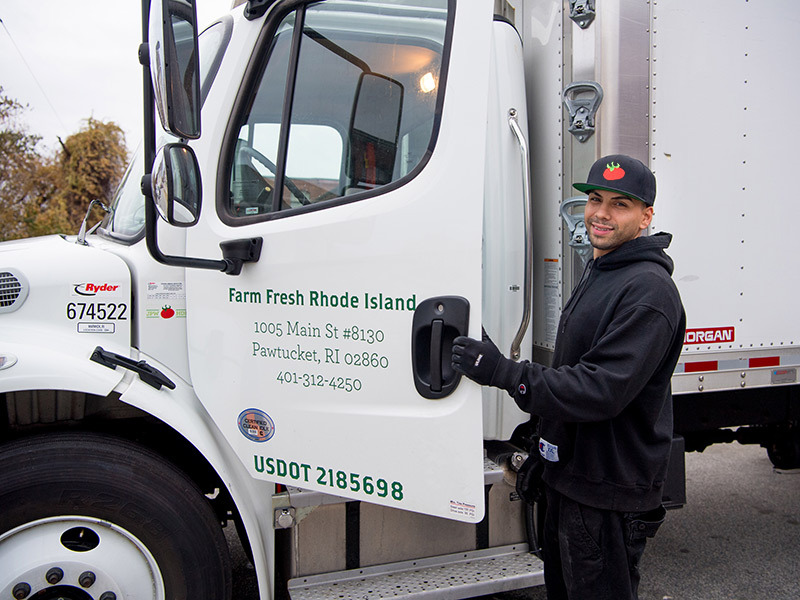 Welcome to these great New England farms and producers that have recently begun selling their products to local wholesale buyers across RI and the Boston-metro area through Market Mobile! 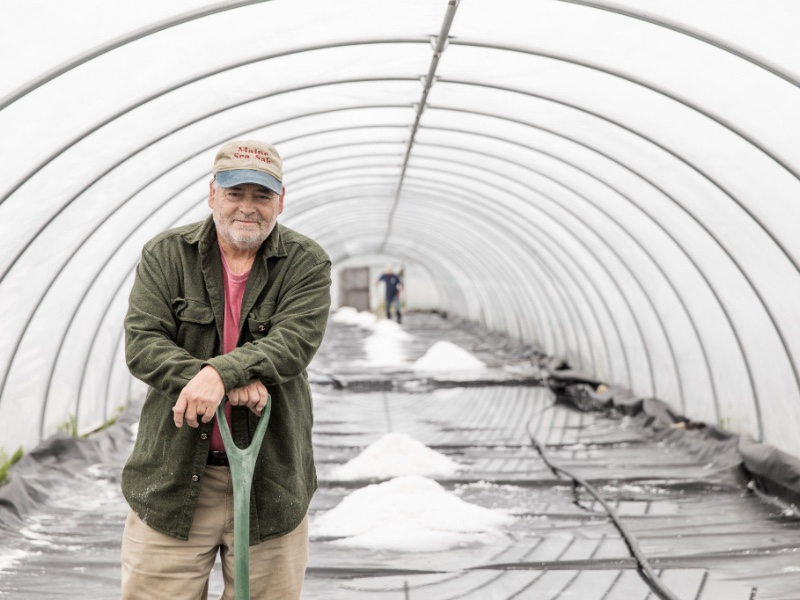 Meet Lalibela Farm, Maine Sea Salt, Misty Brook Farm, and Vermont Switchel.